The Printer Is Alive Thanks to PrintJinni – and Mobile, Too! Are you thinking about going out and about with your Android phone? Still need to print things without being at a computer? If you have an Epson All in One printer, PrintJinni is going to be your friend. This is an app that was ported from the iPhone first, but that's not a problem. You’re getting fully functional software for your 'Droid that will definitely handle print queues for you. Of course, you can't forget about all of the items that you can print. This isn't just limited to black and white printing. If you want to print out a photo that’s saved to your phone, you can definitely handle that with no problem. Important series of charts and graphs? The PrintJinni can handle all of this and still wait faithfully for you to come up with something else to print. You can print emails, Word documents, PDF files, and even full out web pages. Some things are just easier to discuss when you can visually display them to other people. There's nothing wrong with admitting that you really do need to have a visual aid, of course. Taking your show on the road with Android is something that's pretty easy, but you just need to have the right apps. 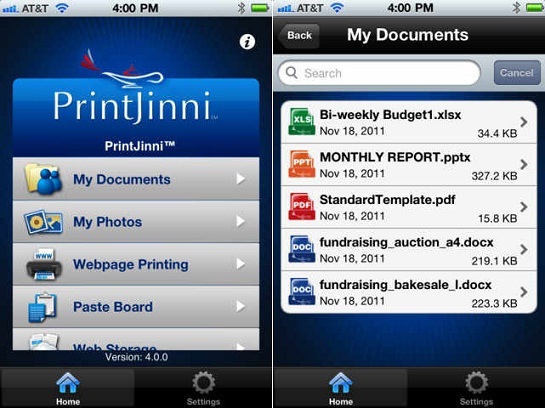 PrintJinni comes in two flavors -- you can do the free version, or you can buy the paid app. The free version gives you a realistic demo of the app, but if you're going to be a power user, we definitely recommend the paid version instead. All in all, this is an app that really speaks for itself -- why not check it out today? Previous article:Gamers, Get Your Fix on the Go with Dark Summoner! Next article:Presentation Ready – Check Out the EasyPPT App!